A major research focus in our lab is to solve how the major human pathogen Chlamydia manipulates host cell function in order to cause infectious disease. We apply a diverse array of genetic, cellular, and molecular techniques to reveal the underlying mechanisms of pathogenesis for these highly successful bacteria. Intracellular pathogens have evolved numerous strategies for promoting their exit from host cells, consistent with the essential role of exit for pathogenesis. Yet despite this fundamental importance, microbial exit largely remains an unexplored research area. Efforts in our lab aim to advance understanding of this new theme. 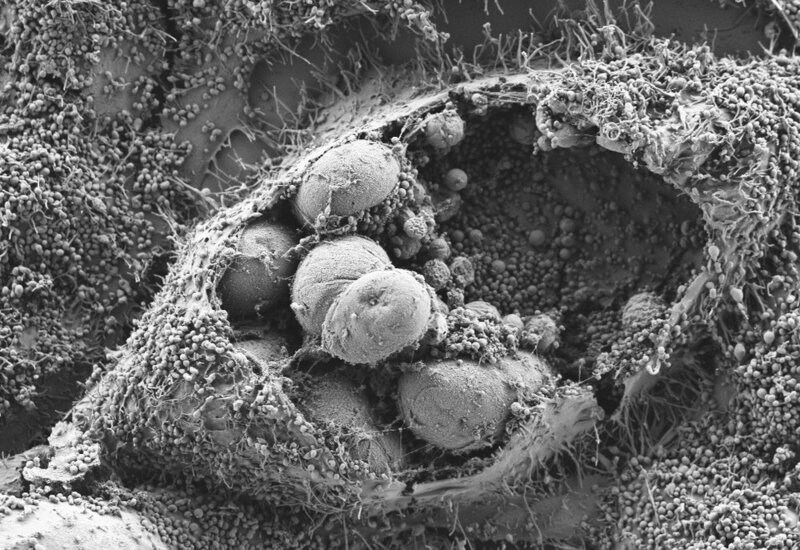 Our pioneering discoveries forged the current understanding of Chlamydia exit from host cells. Chlamydiae possess two mechanisms for accomplishing cellular escape that are mutually exclusive: extrusion and lysis. Extrusion is a packaged release of Chlamydiain which the bacteria are pinched off from the host cell into a membrane-encased compartment, a process that leaves the original host cell intact. Extrusions are novel structures that enhance the biology of Chlamydia infection in many fascinating ways, such as serving as a ‘stealth shuttle’ as these bacteria attempt to elude the host immune system. Genome-wide discovery and characterization of virulence determinants for Chlamydia remains a major unaddressed research area. Through recent landmark advances in genetic manipulation of Chlamydia, and a rich collaboration with Scott Hefty and Dan Rockey that exploits new methodologies for genetic engineering in Chlamydia, we are working to discover the Chlamydia genes and host protein targets that play critical roles in Chlamydia infection and pathogenesis. Successful infection of host cells by Chlamydia requires continuous interactions between scores of bacteria and host proteins, in a manner that ultimately benefits the pathogen. Identification and characterization of these protein interactions is a high priority research area, and may spearhead the development of novel antimicrobials. We are developing and exploiting novel proteomic systems to probe unique interactions between intracellular Chlamydia and host cell targets. ChlamBase is an open database and encourages data contributions from the Chlamydia research community. Contribute today, and your updates will be instantly visible to the field! We are part of a multi-laboratory team at the University of Washington focused on developing novel antimicrobial drugs to treat sexually transmitted infections (STIs) caused by Chlamydia trachomatis, Neisseria gonorrhoeae, and Mycoplasma genitalium. From the unique strengths of our team, we are uniquely poised to combat the emerging threats of untreatable N. gonorrhoeae and M. genitalium infections. We employ a structure-based approach, using crystal structures and virtual models provided by the Seattle Structural Genomics Center for Infectious Disease (SSGCID). The Hybiske Lab is located at the UW Medicine – South Lake Union research cluster, situated near picturesque Lake Union, the Space Needle, the Center for Infectious Disease Research, the Allen Institute, Fred Hutch, and downtown Seattle. The Hybiske lab is always interested in hearing from innovative individuals: prospective graduate students, postdocs, fellows, and undergraduate students. We are part of an unparalleled nexus of interdepartmental research expertise in microbial pathogenesis, infectious diseases, and global health at the University of Washington. We also engage in collaborative interactions with the Center for Emerging and Reemerging Infectious Diseases (CERID), Global Health, Microbiology, the Center for AIDS and STD, the Center for Infectious Disease Research (CIDR), and the Center for Innate Immunity and Immune Disease (CIIID). You must apply (and be accepted by) the Pathobiology PhD Program. UW students majoring in Microbiology or similar areas are encouraged to appy. Contact Kevin by email to inquire about possible openings. Please provide a copy of your current academic transcript, a resume, and a detailed statement of why you are a good fit for our possible needs. Copyright © 2016 The Hybiske Lab. All rights reserved.